Today I discovered what happens when you combine an enclosed space (photo is NOT our actual plant tower - my camera is in the other room and I am cozy under a quilt....), a few egg cartons full of damp soil and water, and warm (very warm) sunshine. The thermometer registered 94 degrees as the high, and 94% humidity. So a bottom tray has been constructed (thanks, sweetie!) to contain the moisture and protect the hardwood floor, the back vent has been opened, and we shall see how tomatoes and peppers germinate in the tropics. Anyone seen a lost "goose"? Seems that one of my flying geese flew the coop. These were made in sets of 4 from one large square of the orange (these were my Sew in the Snow Day project), so I DID make enough - I just don't know where Goosy Goosy Gander has wandered off to!!! Lucky for me I have enough scraps of the orange to make a replacement. Believe it or not it is the white that I used up the very last bits of. Maybe I will leave a trail of dried corn in my studio and see if that brings the stray goose out of hiding??? Last Sunday I was able to enjoy a little quality time in my garden - deadheading some flowers I had left on the stalks for the birds to enjoy, and raking up some of the leaves and debris that were covering up my tulip bed. I filled 2 paper leaf bags for the town to collect for composting, and it felt good to get out and stretch. I am sporting these this spring. It's not much of a picture, but it is the biggest image I could find. I was so happy to find these after trying on boot after boot in all sorts of different stores and having them all be too narrow for my foot. I even tried the men's - I was not a very happy shopper. So my feet are warm and dry, my hyacinths and tulips are peeking up above ground level, my mini daffodils have buds on them, and the plan for now through April 1st is to get some seeds in to start in my indoor "greenhouse" (a shelving unit with a vinyl canopy over it to keep in the warmth), and to get some greens (spinach and lettuce) and peas started outside. Oh it feels good to have soil under my fingernails again! Of course I still like the sewing lint and threads on my clothes, too. This is the start of the "torn" season!!! Inside our outside? Garden or sew? The Munchkin is asking about planting this year - I have a feeling gardening may win out for a while. Then again - it was snowing again as recently as Friday. (FINALLY) and this is how it will stay. And now to measure up some backing and send this one off to Jill for quilting on the frame- because with all that wide open muslin I want something a little denser than I am willing to attempt on my own. Two Strikes... and a Home Run! To start at the beginning - the fabric in this quilt (the light and medium blue - not the borders or the muslin) was previously owned by my nephew's grandmother (my husband's brother's wife's mother) - who used those types of fabrics to line steamer trunks when she refurbished them. These were leftover pieces that I acquired from her in a community wide yard sale - probably about 10 years ago. The fabrics then sat in my drawer for about 8 years, until one day I decided that all the nieces and nephews on my husband's side of the family would get graduation quilts from me. Unfortunately, I was already one quilt behind - so thought it would be fun (and thrifty) to get caught up and make a quilt for the oldest nephew out of the fabric from his grandmother. 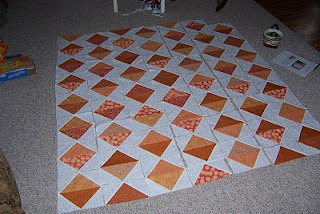 My first plan was to make Buzz Saw blocks - using this pattern that started out with half square triangles. 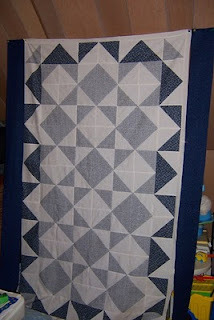 So when I went to the quilt retreat in Ohio in 2009, this was one of the projects I brought. However I forgot how monotonous it can be to sew nothing but 2 color HST's all day - so it got put aside. When I picked it up again, I stitched all the HST's and then proceeded to stitch my first buzz saw block. FAIL!!! 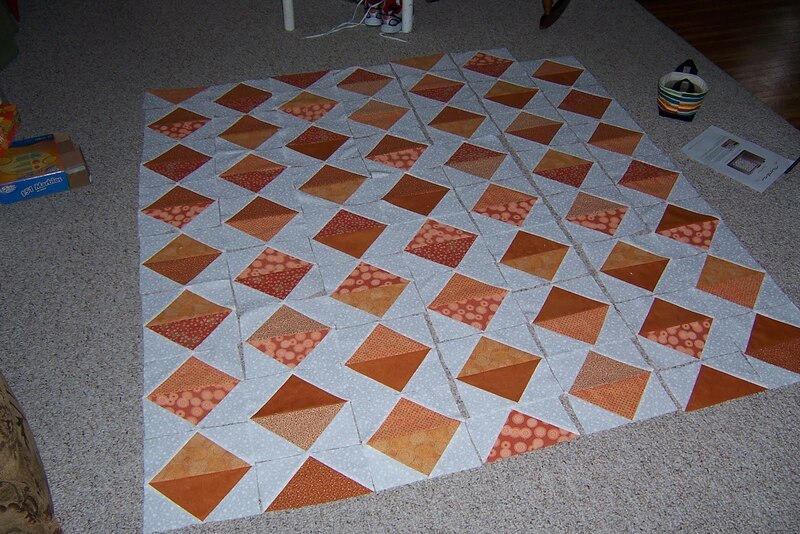 Not sure where I erred, but the components ended up as rectangles rather than squares, so the block was very wonky. Very very very wonky. Unusably wonky. By this time the 2nd nephew was fast approaching graduation, and it was his grandmother, too - so I thought I could use the HST's in 2 groups for the centers of 2 quilts, and then add borders round and round to make them a usable size. I even reversed the settings so that they would be similar - but not identical. FAIL! The one I worked on was ugly, unbalanced, and about the size of a table runner. And I was rapidly running out of fabric. The border fabrics I had - the bits and pieces I was trying to stretch out of the remaining fabrics from "grandma" - were just not enough. I was sewing without a real plan - and it was showing. So back in the drawer these went -I would think about them from time to time -but I was not ready to face all the unstitching I imagined was ahead of me - and I still did not have a plan. To be honest - I think I was really afraid, but unwilling to throw these blocks away. Until about 2 weeks ago at Shellie's, when I FINALLY pulled them out to evaluate and regroup. I ripped off all the extra borders from the one "center", and put the two centers together. OK - now I was seeing something in proportions I liked. 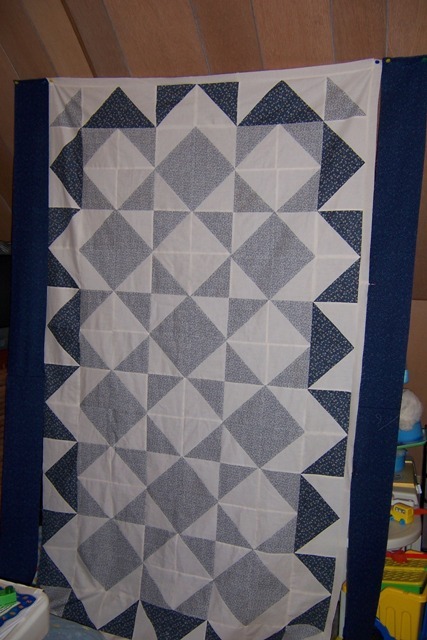 I also figured out the pieced border with the medium blue blocks, and found a dark blue that would work as an additional fabric (that was sadly lacking in my previous efforts). The second nephew is getting a quilt with different fabrics and different colors -but ones I think he will like - and who knows, I may just sneak an extra HST from this quilt in as his label. And we can cross another one of those pesky PIGS off the list! "It is still bad situation now in Japan. We are still nervous about shaking and radiation,but no way to escape. I start to announce to the quilters to send us comfort quilts for the people who are suffered.I would like to do it to the world quilters. 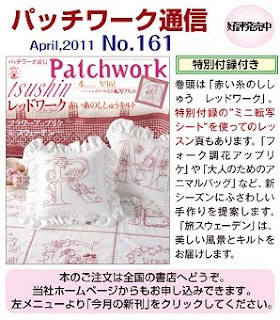 We will deliver the comfort quilts to the people who are very difficult situation. Could you please help to announce it to the quilters? We accept any size of quilts(baby to adult).new or unused. The "Studio" or the "Sty"...? So Jill has asked me about my work space.... and I finally got brave and brought the camera upstairs to "the Studio"... or perhaps "the Sty"??? So I am not going to make any excuses for the mess -this is the normal state of things up here - controlled chaos. As you can probably guess from the slanted ceilings -we are in the attic - it is mostly finished, although the floors are a bit rough, so I have an area rug, foam squares and a chair mat on the floor. I don't do floor layout of quilts up here - I go downstairs for that. When you come up the stairs (steep stairs) you run down the "gauntlet" of storage tubs - this is the main storage area for the household, so not all these bins contain sewing/crafting items. I did have them well labeled at one point, but we need to go through and consolidate, purge, and relabel a few. My biggest problem is dumping things on top of the bins when I bring it upstairs. So when you run down the "gauntlet" towards the big double window (curtains closed as I took these photos at night) you will see off to the right the TV -and just in front of it is the play space for the Munchkin - including a play kitchen and an easel, play table and chairs. These get moved around a lot, although I have used the easel as a mini design wall. On a good day I can get the Munchkin playing up here while I "play," too. When I sit at my table, I can look over my work to the TV and whatever the Munchkin is doing (that is if my pile of projects does not get too high). So this is looking back from the ironing board into my work corner. You can see the closet door behind my chair. I have storage tucked everywhere. My table is a recycled door from the house with a glass top - but the top is longer than the door, so I have this small white bookcase tucked under the overhang. It is piled pretty high with projects and scraps right now, and in front of the bookcase are the leftover props from the Munchkin's jungle birthday party. Need to find a home for - or a recycling purpose for - all of those. And last but not least - here is sewing central. I try to keep the cutting mats as uncovered as possible while working, and do pretty well. My wish list for this space? A drop-in sewing table so I have more flat surface to wrangle large quilts under the throat of my machine. Storage areas underneath that are not broken up by funky old wrought iron legs at a strange angle (family hand me downs - they work for holding up the table but are not ideal). Storage cabinets built into the knee walls so that they are moved back further and give more open space for me and the Munchkin. Whiter/brighter walls to maximize all the good lamps I have up there. An extra wide ironing board. Pergo. Central air conditioning... oh and a maid? But for now - this works... and it works pretty well. We have fun - we get things done - and I can walk away and leave half done projects on the table and not have to worry about cleaning them off to serve dinner. 50% of the time, my design "wall" is the living room floor. I think the other 50% of the time I choose projects that I know will not require a full layout, since it is not often that the floor is wide open and toy free. I also cannot leave the project on the floor while I put the rows together, since 2 floors separate the design floor and the sewing room - so careful pinning and labeling of my layouts is always a must. One of the advantages of purchasing a Wii for my family for Christmas is that the play space for the Wii is also my preferred layout space, and the Munchkin knows if he does not keep that space toy free, he can't play any of his games as there is no room to move. Bonus for quilting Mommy!!! The Munchkin is really very good at helping me with layouts - and I have started enlisting him, even when it is a project I could probably do without laying it out. It helps him understand what I am working on, and we play with patterns and numbers and talk about shapes and grids and other things "quilting math" related. "Bricks and Dreams" is one of those projects I probably could have done without the full layout - but it was more fun to do it with him. I cut a whole bunch of bricks from scraps and various stash selections of brown and orange, with a bit of tiger stripe thrown in for good measure, and sewed them into circles of 6 bricks each. The Munchkin and I then opened up the circles, either by taking out a seam between two bricks, or cutting a brick in half, and laid them out to create this alternating "brick wall" pattern. He had fun constructing the wall and moving the strips around to spread out the bricks he thought should be spread out. The final layout decisions were all his. I stitched this together using a quilt as you go method and just parallel lines with chocolate brown thread, adding a muslin flange to set off the center, and wide brown borders. The "batting" is all flannel strips left over from a baby quilt project I did about 10 years ago, and the back is an unbleached muslin. I am donating this one to the RIT United Way Carnival fundraiser that is coming up - for one of the raffle prizes people can "bid" on. Another bonus of doing this project with the Munchkin was explaining about donations and doing things for others - and that he helped, too. We got hit with a late February storm (again) - and a broken snowblower necessitated us spending some time outside on Saturday shoveling ourselves out. I helped on the driveway a bit - although Hubby did the majority of the work. We get plowed in by both the village plows, and the sidewalk plows, so it can get pretty messy near the end of the driveway. We also had a lot of wind, so a lot of drifting on the driveway side of the house. Disappointingly this was not good packing snow - although it seemed to be sticking to everything else. There was a lot of air in it and we just could not get it to stick to itself to build a snowman, so the Munchkin busied himself making trails through the snow, or sledding down the miniscule incline next to the driveway, or trying to help shovel with the shovel out of his sand box, or posing for pictures. The heaped up piles of chopped up leaves we put into the raised beds seem to have settled, and hopefully all the compost goodness we layered under them is right now making that soil nice and rich and yummy. This weekend we will set up my little indoor greenhouse - basically a 4' tall wire shelving unit with a vinyl cover that I can set up in front of my south facing french doors. Things did well there last year -but with the cover I am hoping for some extra warmth and humidity and an even better kick start to our growing season. The 4' is also about triple the space I had last year - so I have room to try more things! I want to monitor the temperature for a bit before starting anything, as I want to see just how warm it can get in there and how much I will need to ventilate when I am at work during the day. Don't want to cook the greens until they are ready to be eaten, know what I mean?!? We are barely in to March - and the snow of 4 days ago has given way to bare patches of lawn (again). I am sure we will have more snow to come before we can truly call it spring - but it is getting closer... little by little it is getting closer.